The right column below contains images of the Santa Maria Valley Railroad yard as it exists today in correspondence with the developing layout (left column). The layout is modeling a previous era, so trackage will not match exactly. The numbers/arrows on the layout indicate the photographer's approximate location and which way he was looking for each of the pictures. Trackwork is now complete on this module. Next comes wiring, painting the rail, then the ballast and final detailing. 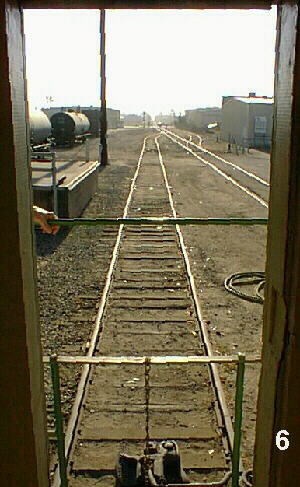 Trackwork will begin on two 4-foot modules (one for the depot on the west and one for the ice house on the east) this next month (October, 2001). 1. Looking east from alongside the enginehouse (building on the left). The street is Miller. 2. Looking west from just west of Miller Street. A corner of the enginehouse can be seen on the right. 3. Looking east while standing on the main line. The prominent siding on the left leads to Caboose No. 180 (to the left of and behind the photographer) which is being restored. Very roughly, the black number on the layout corresponds to the placement of the white number in this picture. 4. Looking east while standing on Miller Street. 5. Looking east directly toward the enginehouse. 6. From inside Caboose No. 180 looking east. Actually, the caboose sits considerably well back (off the HO platform) from where the layout currently begins. The loading dock on the left side of the picture comes off of the old depot building (which is outside the picture to the left and is now a carpet store).